Mercy is the only accredited Chest Pain Center in Johnson County. The Mercy Chest Pain Center strives to provide the most timely and highest quality care for patients at risk for having a heart attack. This is made possible by a partnership between emergency doctors, cardiologists, critical care nurses, and paramedics. They use established protocols to assess, diagnose, and treat patients experiencing chest pain symptoms. These protocols allow for early recognition and treatment of patients during the critical early stages of a heart attack. This is when treatments are most effective. These protocols also allow doctors to better monitor patients when it is not clear whether they are having a heart attack. This monitoring helps ensure that patients are neither sent home too early nor admitted unnecessarily. "Code STEMI" is the protocol that allows emergency responders to alert doctors about a possible heart attack victim before the patient even reaches the hospital. Treatment begins immediately. Paramedics have the ability to transmit the patient’s 12-lead electrocardiogram (ECG) directly to Mercy’s Emergency Care Unit. 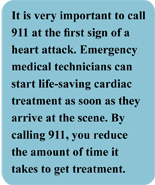 With this information, the doctor can immediately diagnose a heart attack. At the doctor’s order, the cardiac cath lab is prepared and the necessary staff members are called. Why a chest pain center? Increasing the accuracy and effectiveness of the treatment.